Mix ingredients in Paris and NYC. Spice with a pinch of rejection. Then add 2 book deals. Serve to an audience of bloggers, cooks, gourmands and people old enough to have watched Julia Child on TV. Julie & Julia is a movie about an ordinary woman, Julie Powell, who cooked her way through Mastering the Art of French Cooking by Julia Child (1961.) Julie cooked all 524 recipes in 365 days while working full time(!) She blogged about the experience. The other half of the movie follows Julia Child to Paris with her diplomat husband in the 1950s. Julia falls in love with French food, learns to cook at the Cordon Bleu and decides to bring classic French cooking to Americans by writing a cook book. My mother used to watch Julia Child on TV, and Mastering the Art of French Cooking was on our kitchen bookshelf. After college, I lived in Cambridge, Massachusetts. For special occasions my husband Henry and I shopped at Savenor’s, Julia’s butcher. We hoped to run into her near the ostrich steaks but never did. Even though I can’t eat classic French cooking (I’m lactose intolerant,) Julia was my introduction to the love of fine food. There was the promise that gourmet food can be made by anyone. Well, anyone with a block of butter, a butcher knife and six hours spare time! Reviews in The New Yorker and the NYT stated that the Julie/blogger part couldn’t match the Julia/chef part of the movie. The reviewers claimed that Meryl Streep doesn’t do a fine impersonation of Julia Child; she IS Julia. This was true. The screen lit up with Julia/Meryl in Paris. Julie's attempt to cook Julia’s recipes in just one year was a fun premise for a blog but didn’t work as well as a movie plot. Especially because the character in the movie was whiny and self-involved. As a blogger, I was hoping to see more about the blogging community. Hollywood portrays Julie as an isolated journalist counting her comments and tracking her stats. My personal experience is that blogging is all about the interactive community of commenters AND other bloggers. True, Julie was blogging back in 2002, when most people didn’t even know what a blog was. There weren’t hyperlinks on the profiles to connect bloggers back then. But didn’t Julie have a few blog buddies? I checked out a bunch of blogs before I started mine in January 2007; one was Julie Powell. Her blog was an inspiration to me, especially her fairytale story of going from “secretary” to “author,” thanks to her popular blog. Then Julie got a movie deal. In reality this doesn’t happen often, but this was a rare, true Hollywood moment. One part of blogging that the movie captured well was the supportive/exasperated husband. They have an argument in which he shouts something like: “Are you going to put this fight on your blog? !” My husband thought this scene was hilarious. Henry, a master chef in our kitchen, loved all the cooking scenes too. oh p.s i have tagged you on my post, if you would like to play along, it's just a bit of fun! Gemma, I just saw the preview for Time Travelers Wife and I want to see it. I loved the book. Thanks for thinking of me, but I don't do tags or memes. I can't wait to see this and I'm hoping to go this weekend. Phillip, go and blog about it. It has your name written all over it. All that's missing would be any garden scenes. Thanks for the review and I also watched Julia Childs on PBS growing up and loved the show. I am hoping to see the movie as soon as I can. I saw the trailer for this lovely movie at the cinema the other day. I'm off to see it very soon. Yes, food and blogging rather than the world exploding and robots etc. I can't wait to see this movie. Thanks for the review. Oh Lord, I loved this movie. It made me want to book Boeuf Bourguignon, sharpen all my knives and buy tons of Le Creuset cookware. It also confirmed my belief that Meryl Streep is a wizard! Of course, that would be COOK Boeuf Bourguignon. Scheesh. It IS a fairy tale to get a book/movie deal out of blogging about your life, but I'm quite satisfied to just read so much good stuff and make some friends along the way. p.s. I'm sad that you never ran into Julia Child at the butcher's. p.p.s. Do you suppose that support groups for the spouses of bloggers will be the next big thing? Tracy, Tina and Elizabeth, I’d love to know what you think of the movie. The director, Nora Ephron also did "You’ve Got Mail" – the first movie of romance via email. Rose, have you ever seen a Meryl Streep movie you’ve disliked? She totally outdid herself on this one. Becca, welcome to my blog! Pamela, I’d rather book the Boeuf than cook it myself after seeing how much work it takes. I’m not all surprised you loved this movie too. Meryl was indeed magical. Bee, you will LOVE this movie too. I haven’t read Julie Powell’s book so good to get your recommendation of it. Maybe the spouses of bloggers should post a blog of their own… blog widows: Blidows or Widlogs? Powell is divorced now. ACIL, Meryl Streep is my favorite actress too. I loved her Devil Wears Prada. 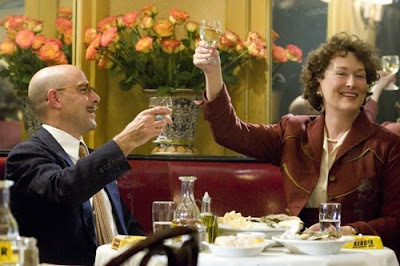 Stanley Tucci from that movie plays her husband in Julie & Julia. I so want to see this movie! Thanks for the review! I loved the movie and your review, Sarah. Does it get any better with Merle Streep? That last line you wrote had me laughing too. My daughter found a t-shirt that said "I am so blogging this" and she said Mom, "I found a shirt for you!" I know sometimes I can be excessive but I think I've found my blogging pace now. Oh, I cannot wait to see this movie. Bee bought this book for me when we were at Books for Cooks in London. I inhaled it. What fun! Julie Child is one of my favorite cultural icons. I was a few years too old when Sesame Street came out, and her shows were my gateway to a lifelong love of PBS. A had a good friend many years ago whose mother was Julia Child's personal secretary. I have been hesitant at seeing this movie, because I thought the premise was weak, but after your review I may go. Thank you! Thanks for the review - I've been dying to see this movie, and can't wait to go. We had Julia Child's cookbook on our shelf when I was growing up, and I inherited it when I got married. The recipes are a bit involved (and rich) for me, but I love to read them, anyway. This is the second wonderful review I've read this morning. Can't wait to see it! so believable as Julia Child. I could have seen more showing the success of her TV Career and how Paul Child had helped to make that happen. Kelly, go see it. It will be a good pick me up. Cynthia, love that t-shirt! Good to hear you found your pace. Troutbirder, you may be right. Meryl always steals the show. JAPRA, so that’s 2 blogger recommendations for the book. I hope the film gets to the Netherlands. Les, how cool to have that personal connection to the master chef. I’ll be curious to hear what you think of the movie. Mary Ellen, don’t you wish the movie came out earlier this summer when it was raining every day? We saw on a sunny gorgeous weekend, but it’s good to have another one. CM, I’d be interested in hearing what you think of it given your restaurant experience. Matt, welcome to my blog and thanks for sharing your reaction to the movie. I also left the movie hungry for more of Julia’s story. Thanks for the commentary. I can't wait to see this movie. Sounds wonderful. I'll have to sneak off to a matinee once while my kids are in school. Thanks for this delightful review... Meryl Streep is, in every sense, a divine actress.. and the plot sounds like something I can enjoy on a cozy Sunday afternoon. Elenka, Shauna and Phoenix, enjoy and let me know what you think of the movie. I loved this movie! I mean, blogging, good food, Paris!, rejection followed by success! I thought all of it was great, including the whiny Julie, especially when she was in her office and found out she had 53 comments and she didn't know any of the people who were commenting. And then tears of joy as Julia stood on the porch with the letter from her publisher and when Julie checked her messages from all the agents and editors. Nice post. Thanks. Late to this post (back to school madness), but I too blogged about the film last week. I just loved it. The best part was seeing Julia Child as a writer and the struggle she had to get published. I was so inspired- to cook, to write and, of course, to eat! Cynthia, you captured the highlights well. Dawn, I’m busy with the back to school shopping and preseason soccer. It’s hard to keep up with my work let alone blogs at this time. One more week and my kids will be back to school. I got hungry watching the movie too. Barrie, go see the movie. You’ll love it.